Tribute for Professor ANNA GREIDANUS – 25 Years! Show and tell is one of the greatest games we play in grade school. Unfortunately, in the academic world, its pedagogical merits are easily forgotten. Professors tend not to fail when it is comes to using words, but we are sometimes at a loss when it comes to communicating with visuals. Anna Greidanus does not merely lecture or lead discussions, she demonstrates. 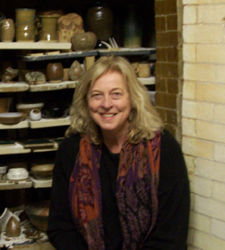 Rather than teach from a podium, she sits at the wheel, producing ceramic vessels as she informs her students. In and out of the classroom, Anna regularly reveals the gift of show and tell. Anna is the youngest child of Frisian immigrants. Born and raised in Delavan WI, she spent her childhood on a dairy farm, daydreaming and helping to care for animals. Anna attended Calvin College, where she majored in art education. Only a few months after her graduation in 1979, Anna began teaching at Grand Rapids Christian High. During this time, she also began her M.F.A. degree at Michigan State University in the ceramic arts. After teaching high school for four years, Anna returned to her alma mater as an instructor. During her tenure at Calvin College, Anna has taught numerous courses in the visual arts, ranging from sculpture to bookmaking. She has also led off-campus interims to China as well as to Russia. Nonetheless, ceramics has remained her passion. Some people have clay of feet; Anna has clay all over her hands. She revels in caressing the earth as she searches for ways to convey its spiritual significance. In her teaching, she effectively reveals the tactile dimension of sight. Anna not only encourages her students to make meaningful objects, she shows them how their studio work can help shape the experience of materials and place. As one might expect, Anna enjoys opening “Big Bertha” (the kiln) with her students. Many of them speak of the pleasures of touching recently fired pieces, still warm from potter’s oven. Anna’s students also voice their appreciation for inviting them into her home for a dinner served on ceramic tableware of their own making at the close of each semester. Her compassion for students and her service to the community have been exemplary. Anna has made liturgical vessels for many churches. She and her students have also produced handcrafted soup bowls, donating them in support of the hungry. Anna’s enthusiasm for teaching extends well beyond the classroom. She has literally led workshops across the country, from New Jersey to Washington. Anna has participated in numerous juried exhibitions throughout the United States. One of her most memorable achievements, however, was a one-person exhibition at the Sint Joseph Galerie in Leeuwaarden (NL), where Anna was able to show and tell about her work in Frisian, a language she learned in her childhood. In 2010, Anna was diagnosed with breast cancer. While undergoing treatment, she developed a collaborative art project to support all those touched by the disease. The installation, entitled The Survivors Project, offered therapeutic healing as it revealed various responses to living with cancer. The exhibition, which included objects produced by patients as well as caregivers, was displayed at the Lemmen-Holton Cancer Pavilion of Spectrum Hospital as part of ArtPrize. Throughout this project, Anna not only presented her story of battling the disease, she has also given others opportunities to show and tell their experiences. Thankfully, her own health prognosis is good. Nonetheless, Anna is continuing her efforts and is planning to repeat this collaborative installation with new work and new participants. Calvin College has been truly blessed to have Anna Greidanus among its faculty. This entry was posted in Ceramics, Education, News. Bookmark the permalink.